From the moment my brother Mike forwarded the Missouri Conservation article about the MR340, I knew I was going to attempt the river race. Finish? Well who knows? Trip: 1200 mile drive to Kansas City at the peak of hurricane season. Training for the worlds longest non-stop kayak race: Lastly and most important, how would my wife take to me training every weekend? She gets seriously irate about anything that cuts into her fishing time. Florida Autumn, hot and humid passed quickly. Winter soon arrived along with my new QCC700 touring kayak. A limited truce was arranged with my wife: she would still get at least one day a weekend for fishing trips and occasionally, I could train on the alternate day. Not ideal, but, work with what you have. Saturday, April 17, my wife and I kayaked and fished the Banana River No Motor Zone. The Banana River is a brackish salt water lagoon bordering the southeast corner of Kennedy Space Center. 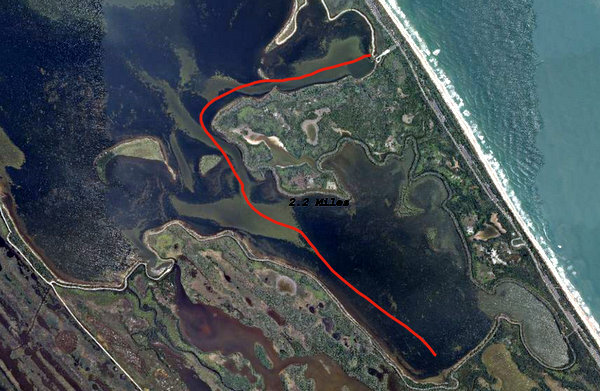 The No Motor Zone is an 8000 foot stretch of water, set aside for Manatee habitat. Sailboats, canoes & kayaks are the only boats allowed in the “No Motor Zone” and a crowded day in the Zone might consist of a dozen kayaks barely discernible across the fish packed water. My Saturday practice for the MR340 Race consisted of enjoying the beautiful day, casting top water plugs, getting used to my new QC700 kayak and wearing my Personal Flotation Device. In twenty years of canoeing Florida’s wetlands, I had never, not even once, worn the life jacket that was required by law to be in the boat. However the rules for MR340 race was that the PFD had to be worn at all times on the water. Our Saturday turned out to be one of those rare times on the Florida Intercoastal Waterway: No wind, the water was mirror glass calm. Sounds of jumping and feeding fish carried amazing distances over the river. We had a fine day of boating and fishing; a decent haul of light tackle “catch and release” Sea Trout, Ladyfish and the occasional Sail Catfish. Of course, the usual lagoon inhabitants kept up a steady parade for our entertainment. Osprey and Pelicans dove from the sky into schools of scattering Mullet. The Sea Hawks would lift from the river, fish firmly gripped in their claws and then stop in mid flight to shake the water from their feathers. Flocks of late season Widgeon and Teal would take flight when we ventured too close to them, the noise from hundreds of ducks simulating the slow rumble of thunder. Hovering flocks of white and black Terns would betray the location of small baitfish and the Terns would dive from the sky imitating the Ospreys. Snaked necked Cormorants would surface near the Terns to swallow silvery fish, further verifying the presence of bait. 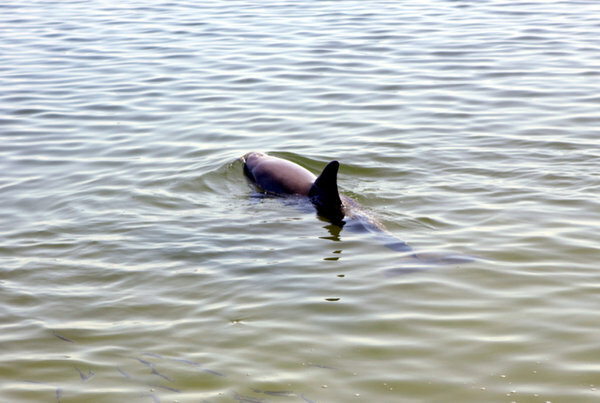 Families of Bottle-nosed Dolphins exhaled nosily as they corralled schools of Mullet, and on a smaller scale, packs of feasting Jack Crevalle kept the Menhaden skipping across the surface in panic. Individual Mullet jumped for fun in the shallow flats; spooky Red Drum occasionally stood on their heads, spotted tails waving above the water as they dug for clams or Blue Crabs. 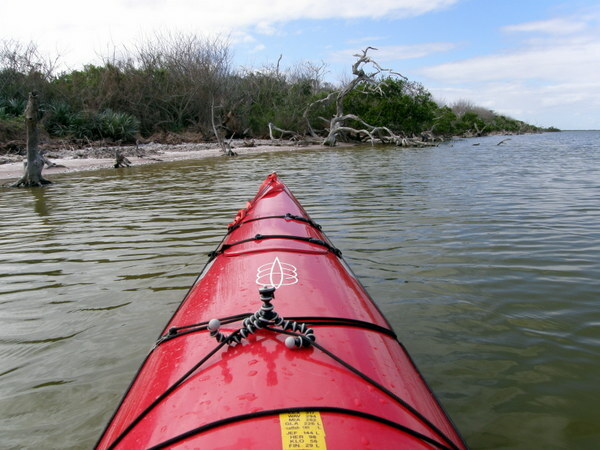 In the shallow flats, small Alligators shadowed our kayaks, hoping for a gut hooked trout and brown Sting Rays would shoot from below the boats as we paddled across their hideouts in the clear water of the flats. Out in the deeper water, tarpon rolled in the sunlight and the occasional blue jelly fish would drift by our boats, cut off forever from the ocean. 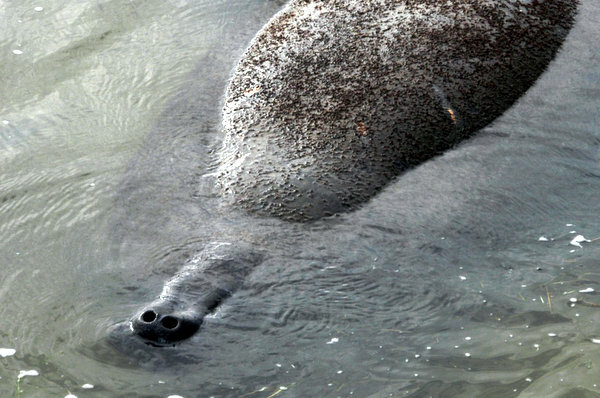 And the Manatees; the only real hazard to a kayaker, would betray their presence by the huge water boil forced to surface. Occasionally their tiny heads would break the surface, loudly exhale through twin nostrils, only to submerge again in their endless quest for turtle grass. Loud exhale, warning of their presence. Towards the afternoon, the wind began blowing from the north; foreshadowing the approach of the late season cold front, predicted by the local weatherman to arrive overnight. And so calling it a day, we reluctantly headed for the truck and home. Sunday morning arrived, as we relaxed with coffee, reading the paper and watching our pet turkeys do their usual battle for Alpha status. The cold front had arrived during the night, bringing strong winds and a ten degree drop in temperature. Palm fronds and pine cones flew across the yard. Small Craft advisories had been issued for the Intercoastal waterway. "My day for MR340 practice"
Nevertheless, I recalled contributors to the (MR340) River Miles web site had posted that the wind on the Missouri River could be bad; so keeping a positive spin on the local weather conditions, I decided to get in some additional boat time in rough water and strong winds. 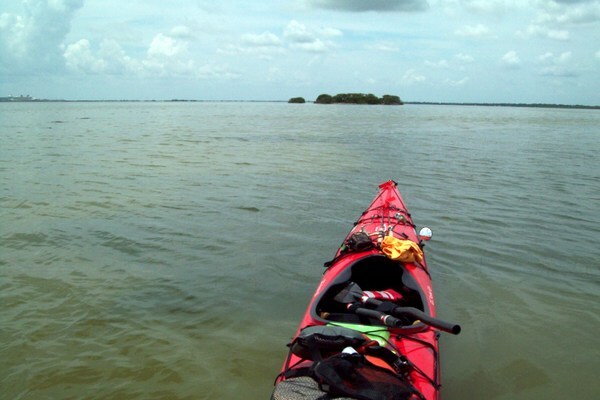 I explained to my wife, the decision to head to Mosquito Lagoon for some kayaking and perhaps even a little hiking. She decided to come along and try some fishing in the lee of the south lagoon islands. 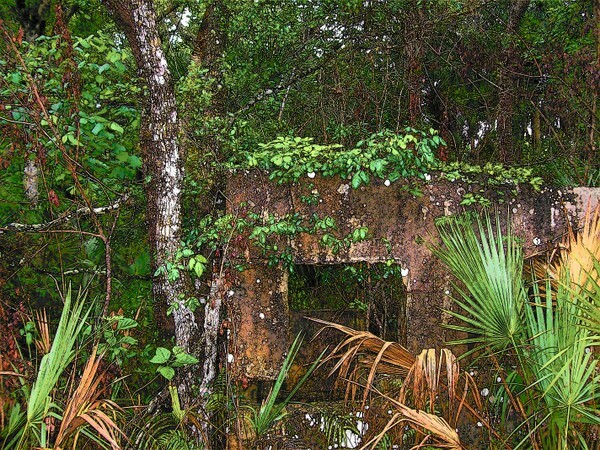 --She was not about to hike the shoreline of the lagoon, renown for eastern diamondback rattlesnakes. We pulled up to the boat ramp and briefly had second doubts about kayaking. Out on the lagoon, the wind had whipped up large whitecaps sending clumps of foam and spray whipping across the surface. Never the less, “Since we were already there” we launched the kayaks, hugging the shore line and seeking shelter from the wind wherever possible. Mosquito Lagoon is a salt water estuary that forms the northern boundary for Kennedy Space Center and Merritt Island Wildlife Refuge. The Lagoon is similar to the Banana River, except for its world famous reputation for huge Redfish and a higher salt content in the brackish water. Powerboats are allowed in most areas of the lagoon. This day however, very few boats had ventured onto the stormy water. 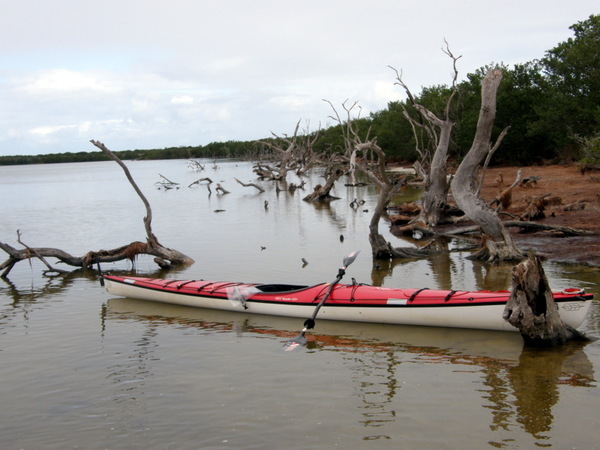 We donned our PFDs and pushed into Eddy Creek, for the mile paddle to lagoon proper. Finally we reached the small cluster of mangrove islands we had named “The Shark Islands” due to the seeming abundance of juvenile sharks caught in the years past. My wife safe from the wind began to fish-----only open water and the distant shore of the lagoon lay beyond the shelter of the Shark Islands. Trained from too many years of SCUBA trips and the odd concept of “Backup Plans” my wife insisted on knowing my exact destination. With some irritation, I pointed to the distant tree lined shore and said “Over there, south”. With kayaking confidence gained over the Florida winter; I paddled the QCC from the sheltering Islands, into the whitewashed Lagoon. The boat had proven equal to any weather and water conditions yet tested and without any problems I reached the southern end of the lagoon and turned east towards the beach. Why the ruins? Where are the People? But my interest that morning lay in a finding the location of an old artesian well, that on my last visit, still flowed water into the lagoon. Whoever had lived on the old midden had sunk a well into the shallow freshwater aquifer for sulfur tainted fresh water. During my earlier explorations I had found the iron pipe coated in white residue, pumping out really smelly water. In recent years along the Florida coast, most of leaking artesian wells had been capped off to preserve the ever shrinking fresh water aquifer and I wanted to see if this particular well had been capped. I had chosen this day for exploring because, I knew the fishing would be lousy and the location of the ruins could only be reached by boat, hence a destination for my MR340 rough water practice. But also I faced the annual deadline of Mosquito season; only a month away, when any entrance into these woods attracted hordes of voracious Mosquitoes whose aggression would put Africanized Honey Bees to shame. Hiking season on the lagoon would soon be over until next winter. At last I spotted the clump of palm trees and even a located a convenient path, a combination Alligator slide and feral hog trail that offered a route from the thickly brushed lagoon shore into the oak and cedar interior. Getting out of the kayak, I put on my hiking boots, grabbed my wallet, cell phone, camelback and doused my ankles with Deep Woods Off for them Chigger critters. Stepping onto the still wet muddy slide, I was not overly concerned about the gator or hogs tracks, but kept an eye out for any giant Eastern Diamondbacks that might ruin my weekend. However the animal path quickly turned away from where I remembered the hidden ruins. So leaving the gator slide/ hog trail, I stepped into undergrowth that became so dense that sometimes even ten feet visibility was a luxury. In some places I had to drop to all fours (Still thinking about those Diamondbacks) to crawl forward. Whenever I stood upright, I had to use a broken palm frond as my “Spider Stick” as there seemed to be a plethora of Banana Spiders and smaller unnamed spiders and webs. “Look down, look forward, move spider, step forward” Repeat. Pushing steadily deeper into the woods I was really surprised by the amount of oaks and cedars up rooted by hurricanes. “Rootwads” I had heard the fallen trees called in Missouri. Finally about two hundred feet into the woods I smelled the rank odor of sulfur. “Dam I’m good” I thought. Before long I found the little stream caused by the artesian well outflow and pushing Cedar branches aside, turned to follow the little creek upstream to the well pipe. Through the canopied shadows I spied the encrusted pipe and something else I had not recalled from my last visit. I could just make out the outline of a little stone basin adjacent to the pipe. The person or persons who had originally installed the well had also constructed a small catchment to collect water. I could only assume that the 2’ by 2’ cement basin was a drinking bowl for their dogs or goats. Heck it could even have been a fancy bird bath. I dodged another yellow striped spider, its web strung between two palm trees and approached to the well pipe and little basin. Sometimes the mind or your eyes plays tricks with you. As I stood above the crusty white pipe with its smelly flowing water, I looked for, but could not see the little pond and the expected pool of sulfur water. Momentarily confused, I glanced to my right and spied the serrated tail of a grayish dragon? I traced the jagged tail back towards me, to a huge scaly black clawed foot, a bulging scaled belly, another foot and then to an armored head the size of a Race Horse. 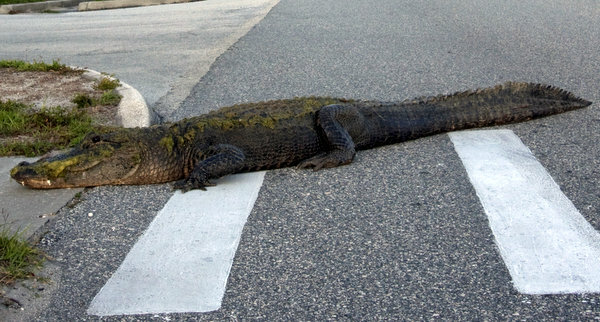 Not more than three feet away from my shoes, staring into my wide eyes, lay an American Alligator every bit of 12 feet in length. The Gatorsaur’s belly lay astride the 2’ by 2’ bird bath, enjoying the cool fresh water and completely obscuring the little pool from my sight. It had been years since I have really been scared. How often does that happen in the modern world? And I did not quite make water, but I took one LONG slow step backwards, then another, placing some small trees between me and the motionless Dragon. I cautiously turned, resisting the urge to bolt through the spider webs, and slowly retraced my path towards the lagoon. Once out of perceived alligator charging range, I began whispering and then shouting emphatic expletives that shall not be written down. Well until to next winter, anyway. I pushed the boat into the safety of the squall swept lagoon and went in search of wife.